Have you ever come away from a learning event with a warm glow and a sense of ‘this is just the beginning’? Andrea Kemp reflects on a day of learning in Sheffield. I had this warm glow last week as I pedalled away from The Mowbray Café in the industrial streets of Sheffield, which was host for the second ‘Connected Learning Network’, organised by UK Coaching and with the aim of building a strong community of practice for people involved in learning design from inside and outside the sport and physical activity sector; to share best practice and co-create learning. Kurt Lindley commented on Twitter afterwards that he ‘skipped back to the car park’ and I share his enthusiasm. I’m writing about this because I know how difficult it can be to create the space and environment for meaningful learning, connection, sharing and collaboration. I have left many events mulling over the content, the vibe and the way forward (some I have organised myself! ), so when it all comes together without feeling forced and people are genuinely inspired to get involved and help it to grow, I wonder what was going on for this to happen. The venue is without doubt a key ingredient to creating space for people to think and collaborate. The Mowbray certainly worked well, on the edge of Sheffield allowing for a range of travel choices. I used it as an opportunity to catch the train and cycle which got my day off to a great start zipping across the city under my own steam. Any venue which has on its ‘Arrivals’ webpage “All bikes welcome! Please let us know if you are arriving by the finest form of travel and we’ll be able to accommodate your bike.” is surely already part of the physical activity movement and should be warmly embraced. As an aside – the train wasn’t so up for active travel with ‘space for 2 bikes only’ across 4 carriages. It doesn’t really encourage people to combine cycling and public transport but that’s for another day. 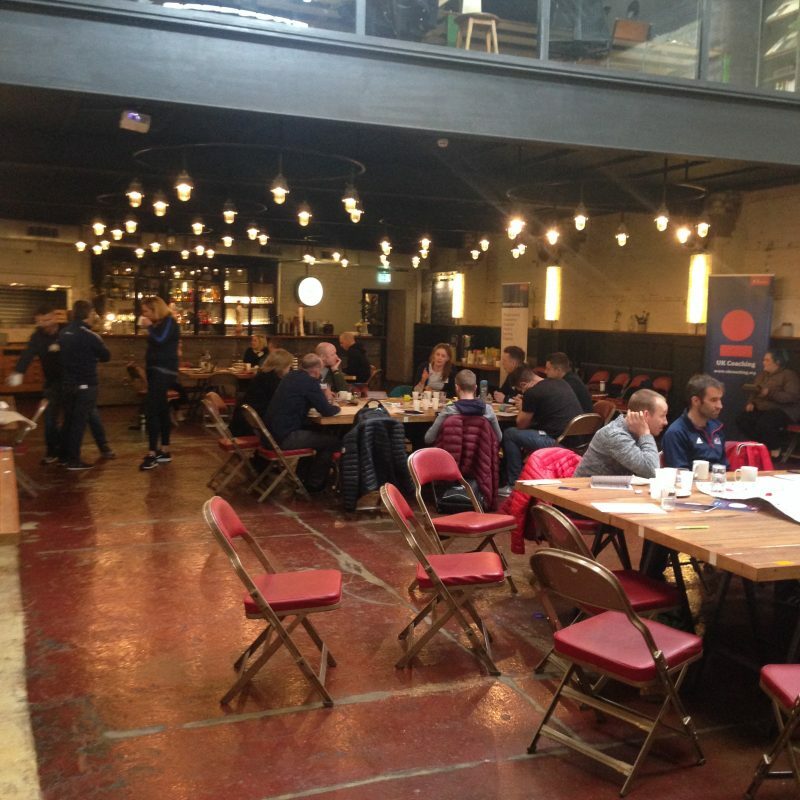 An open room with 3 large tables and bags of space for circulating made it feel relaxed and informal whilst practically allowing for screens, pop up stands, scribble boards, free flowing tea and coffee and tins brimming with biscuits. The café styling added to the sense of stepping out of the day-to-day world of work and into something experimental, social and creative. A personal and warm welcome set the scene and helped to create that sense of belonging we all long for at these gatherings. No major presentations, strategies or objectives, but authentic connection from the off. This event was intentionally about conversation, getting to know each other and building bonds so that we can learn, discover, share and grow together – which should all lead to higher productivity and better outcomes for the work – right? So, after a short ‘scene setting’ we were up and active with speed dating introductions, and I know many people cringe at this point in proceedings, but I’ve never done this and had a bad experience, in fact I’ve met some great people in the 2 minutes of direct and intense connectivity and we’ve often re-connected again later in the day to follow up. It’s a natural way to meet people at weddings and parties so why not apply it to the work environment? And rather than a glass of champagne to hang on to, we were all invited to collect a cup of sweets and then to exchange them as we moved along. Having something to hold while we stood and talked / listened was helpful, if like me, you don’t quite know where to put your hands during stand up chats. Relationships are at the heart of our work so conversations such as this are fundamental to progress. Plus, we’re social beings – it’s in our blood to connect with each other and eye contact is known to boost oxytocin and the feel-good chemicals in us, therefore increasing the chance of rapport and connectivity. “Eye contact, an indication of non-verbal dialogue between humans, can give us an appreciation of being recognized, a sense of intimacy, and can enhance strong empathetic feelings in us.” (Duygu Deniz Özince, A brief look at the neuroscience of eye gaze). Knowing the power of 1:1 conversations, I’m wondering why we would ever start a session aimed at bringing people together for collective action with long presentations and slide shows, but perhaps that’s just what we’re used to, comfortable with and therefore expect as the typical running order? Much of the day was structured around open learning opportunities – allowing participants to choose where they tune in and contribute. In theory this sounds easy, relaxed and flowing, yet I know from experience that it relies heavily on everyone pitching in, being brave with sharing their ideas and putting themselves forward to lead and explore openly from within the group without fear of judgement. With a well-formed group who know and trust each other this is fairly straight forward, but for a gathering of people who don’t know each other it’s down to organisers to enable it to happen and to have enough confidence to allow it to emerge. And it did… one of the real successes of the day was the distributed leadership – so many of the participants led throughout the day which gave a real network feel. It wasn’t delivered or facilitated, it had its own momentum and strength. Everyone had something to offer, a comment, an idea, an experience, a story and crucially everyone wanted to listen in when something was shared – people were there because they had chosen to be, not because they had been sent or they were representing an organisation. My experience of learning in our sector is that it is often led from the front, accompanied by a screen and a slide clicker. We’re almost conditioned to rock up as the audience, to soak in the knowledge and take it away. How do we move forward and create the conditions where we all contribute to shaping the experience for each other? To be the network, to own it and grow it? I guess we have to set out to want to do this from the start. The final tranche of the day was designed to turn the connections into meaningful action. ‘Lightning Talks’ were a 2-minute slot allowing anyone to step forward and to give an update about something they are working on or an upcoming project with a view to connecting with people from the network post-event. By this point, we were gathered together with banter filling the air, encouraging each other to take the stage. Almost like the theatre production after a day of rehearsing – the culmination of efforts and conversations. Then committing to follow up, we used a ball of wool weaving across a circle between participants to demonstrate the network created as we discussed next steps. It felt personal, intimate and buoyant – string but no strings. So, I came home inspired. Inspired to know that there are others in our wider network who a daring to do things differently and inspired to seek out people in my own network who would like to create something similar closer to home. 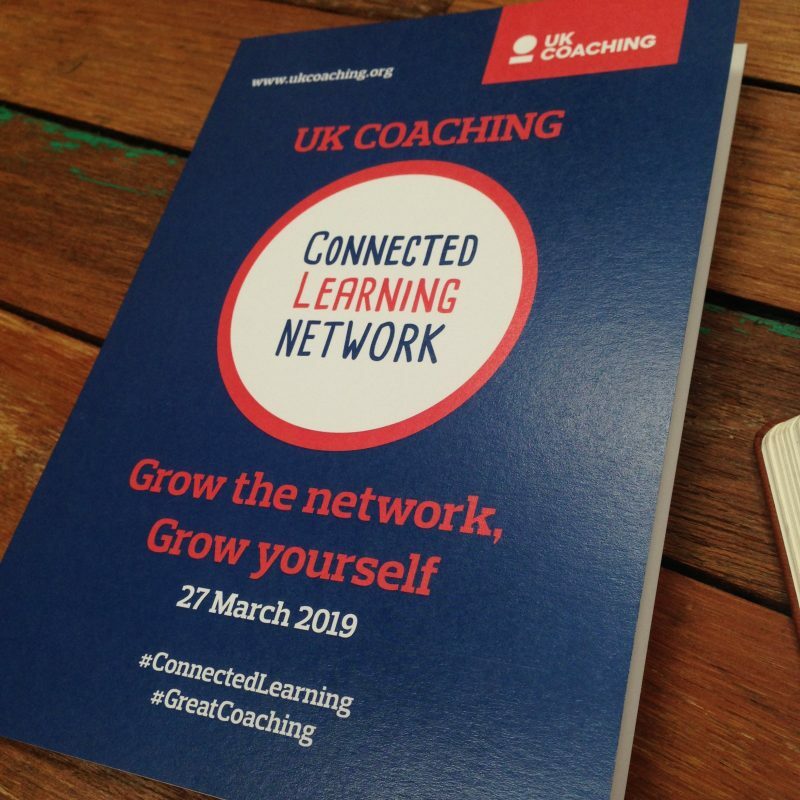 Thank you to everyone who was part of the event, especially Mark Scott and Paul Thompson at UK Coaching who generously arranged the opportunity. I’m looking forward to the next one!